James McFadden has warned the Scotland players to not leave Georgia with the same regrets that still haunt him. 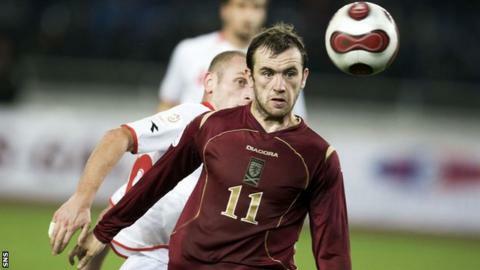 McFadden was a player in the side that lost 2-0 in Tblisi in 2007, when a victory would have set Scotland up to qualify for Euro 2008. The forward was denied a penalty that night, a decision that still irks him. "I've got bad memories of that," McFadden said. "It's a big gripe. It's something that will never leave me. Hopefully, we learn from our mistakes." The game in Tblisi came a few weeks after McFadden's stunning strike earned Scotland a 1-0 win over France in Paris. Georgia that had nothing left to play for in the group. There are parallels with Scotland's return to Tblisi under Gordron Strachan, since the current Georgia side has only three points and is well out of the running. Current Scotland players like Darren Fletcher and Shaun Maloney played alongside McFadden in 2007 and the latter is sure their experience will help on Friday evening. "It's a warning of the pitfalls of what can happen," McFadden said of the 2-0 defeat. "The boys like Fletch who were there before will know the feeling. "It's all right at the time thinking, 'there are games left', but looking back, that's the game that if you win you go to the Euros and that's a big regret. "They'll still be feeling it, because I am. The warning's there and hopefully we put on a performance like the one we did at home [October's 1-0 win]. "We just need to remember that we can come unstuck. There are players involved who were involved that night and they won't want it to happen again. They'll want to exorcise ghosts of Georgia. "Last time we just didn't play well, we didn't put it down to travelling or the pitch or the hotel. "It's a massive game. The Germany game [on Monday at Hampden] takes care of itself, but this is the most important game because it's the one in front of us. It's a difficult place to go, but if we approach it in the proper manner then we can win the game." McFadden is optimistic that, under Strachan, Scotland can qualify for the finals of a major tournament for the first time since 1998. "They're professionals playing at the highest level so they should be able to deal with the pressure," said the former Everton, Motherwell and St Johnstone player. "There will be real excitement and the confidence will be good going into the game. There won't be fear, there will be anticipation to go and win the game to set the Germany game up so that you don't have to play with any pressure. "There's a real optimism about the team and the country, by the fans, the players, everybody. "Before, we've had, 'we're confident but we're going to fail'. This time, it's, 'we're confident and we're going to do it'. There's a genuine belief that we can do it and do it in style." McFadden is currently training with Motherwell while assessing his options as a free agent. He wants to return to playing full-time, but is making do with currently preparing to play in Motherwell captain Keith Lasley's testimonial game against Bolton at Fir Park on Saturday. At heart, though, he remains a passionate Scotland fan. "Once my boy's a wee bit older we'll maybe travel with the Tartan Army and sample that side of it," he added, grinning.